The kindergarten classroom contains children ranging from ages 4 to 6 years of age based on the Montessori principle of mixed are groups. The classroom has two fully qualified and Montessori certified teachers. The kindergarten class also includes an outdoor classroom. This outdoor curriculum includes planting, caring for plants, composting, recording weather, observing animal life-cycles, and caring for the environment in a socially responsible way. The outdoor classroom increases the children’s knowledge of nature and the world around them. The curriculum is designed to better prepare the child for elementary school. In the classroom the emphasis is on academic learning. Reading, writing, and mathematics are included in the everyday classroom curriculum. Spanish language is taught as part of the curriculum for ages 4 to 6. We also offer Mandarin, gymnastics and ballet dance classes on the campus. Schedule a tour to see the enthusiastic learning that takes place for this age group. Our kindergarten program maintains a teacher to student ratio of 1 to 12 so that each kindergarten child is given the utmost attention possible. Our teachers are professionally trained, certified in the Montessori Methodology and hold a bachelor’s degree. You can rest assured that your kindergartener is in good hands. 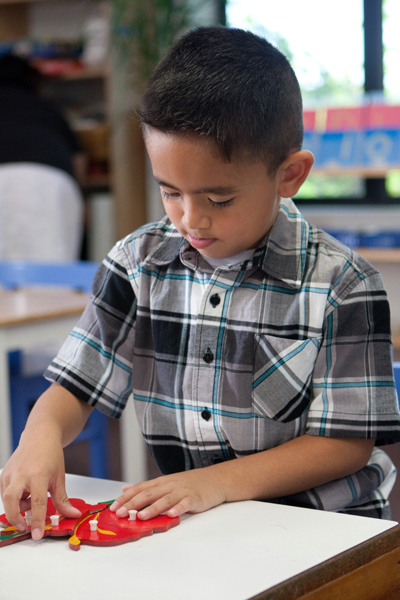 Montessori School at Five Canyons only hires early-childhood qualified teachers. In addition, all head teachers are Montessori Early Childhood credentialed and certified by American Montessori Society-Affiliated. Many of the teachers have been with the school for over 5 years.